The Ireland manager was in conversation with Eamon Dunphy for Paddy Power’s Head2Head programme. REPUBLIC OF IRELAND manager Mick McCarthy, this week appointed for a second spell, believes that his side would not have made the knockout stages at the 2002 World Cup with Roy Keane. Sent home after a heated row in Saipan, Keane refused McCarthy’s invitation to return for the tournament in Japan and South Korea. The Boys in Green went on to qualify from their group, only to lose out on penalties to Spain with a quarter-final spot on offer. McCarthy was speaking to Eamon Dunphy, who fronts Paddy Power’s new programme Head2Head which airs tonight, when Dunphy suggested that Ireland might have gone a long way with Keane there. “If we’d have had him in the frame of mind and mood he was in when we played against Holland and Portugal [in the qualifiers], yeah I agree with that,” McCarthy said. “Having had him in the frame of mind and mood he was in [in Saipan], at the World Cup we wouldn’t have got out of the group. No chance. The 59-year-old added, of how he rang Sir Alex Ferguson in the aftermath to address their relationship and to defend himself against Manchester United. And again, that suggestion came up. “He said to me, ‘You’d have got to the semi-finals if Roy was there.’ I said we wouldn’t have got out of the group. We would have been coming home after the first three games. Martin O’Neill’s successor at the helm delved deeper and deeper into his relationship with Keane. What was it really like from the start, Dunphy asked. “Pretty sh**e to be quite honest. I got on fine with him, I mean there was some suggestion from him that I couldn’t manage teams or manager players, but I’d managed him for five years. In the 23-minute long conversation, McCarthy spoke in-depth about how he went to check out the “crap” conditions in Saipan himself, how he saw it as a “holiday” and a “blowout to go on the piss”, how he wanted Keane at the World Cup “as much as anybody else did” and how the Corkman refused to return. The original mischief maker Eamon Dunphy fronts ‘Paddy Power’s Head2 Head’, which will see the first in a five-part TV series hit Irish screens tonight (Friday), free-to-air on eir Sport 1 at 10pm. 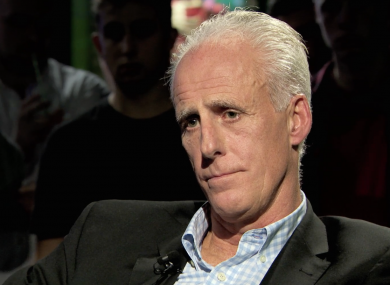 In addition to his conversation with Mick McCarthy, throughout the course of the series, the famed pundit conducts a range of fascinating, in-depth, and intimate interviews with former Irish international and new Republic of Ireland assistant manager Robbie Keane, pundit Graeme Souness, jockey Ruby Walsh and GAA star Tomas O Se. Email “McCarthy: We wouldn't have got out of the group with Roy Keane at 2002 World Cup”. Feedback on “McCarthy: We wouldn't have got out of the group with Roy Keane at 2002 World Cup”.